Preheat oven to 450°. Blanch beans in a large pot of boiling salted water until just tender, 3 to 4 minutes. Drain, plunge into a bowl of ice and water, then drain again and pat dry on a kitchen towel. Toss potatoes and squash separately with 2 Tablespoons oil each, some sea salt, and about two-thirds of thyme sprigs. Roast separately in a single layer on rimmed baking sheets until just tender, 7 to 10 minutes for zucchini and 20 to 25 for potatoes. In a bowl, whisk egg with a pinch of fine sea salt and the vinegar until thick. Whisk in remaining 1 cup oil gradually, drop by drop for the first ¼ cup or so (until the mixture is emulsified) and then in a thin stream until aioli is nice and thick; you may not need all the oil. Alternatively, whirl egg, salt, and vinegar in a blender, then drizzle in oil. Sprinkle garlic with ½ teaspoon fine sea salt. Mince with a chef’s knife, and then use side of blade to crush garlic into a paste. Stir garlic paste into mayonnaise. Taste and add more salt or vinegar if you like. 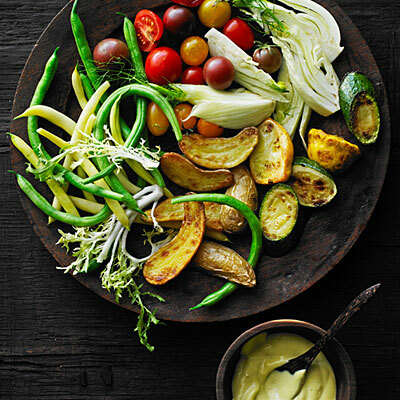 Arrange cooked and raw vegetables on a large platter or long board, top with remaining thyme sprigs, and serve with aioli.